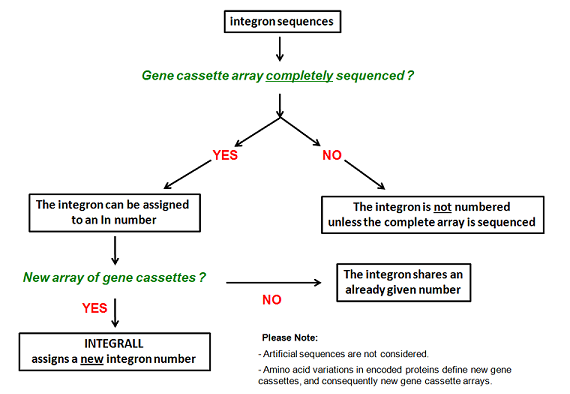 To avoid incorrect naming and the attribution of different names to identical gene cassettes, INTEGRALL suggests the following nomenclature scheme. Check here the list of currently attributed In numbers (courtesy of Dr. Thomas Jové). For new In attributions, please contact us. In the case of aminoglycoside-resistant determinants, INTEGRALL suggests the nomenclature proposed by Novick et al. (1976). Arabic numbers should be used to designate different subdivisions. In the case of trimethoprim-resistant determinants, INTEGRALL has adopted the nomenclature summarised by White and Rawlinson (2001). Arabic numbers should also be used to designate different subdivisions.